Located in Saint-Jorioz, this family-friendly aparthotel is 0.1 mi (0.1 km) from Lake Annecy, and within 6 mi (10 km) of Réserve Naturelle du Bout du Lac and Sevrier Church. Station Roller and Centre Commercial Courier are also within 9 mi (15 km). This family-friendly Saint-Jorioz property is located on the waterfront, 0.2 mi (0.3 km) from Lake Annecy, and within 6 mi (10 km) of Réserve Naturelle du Bout du Lac and Jardins de I'Europe. Sevrier Church and Church of St. Maurice are also within 6 mi (10 km). Situated in Saint-Jorioz, this country house is 0.1 mi (0.1 km) from Lake Annecy and 2.5 mi (4.1 km) from Sevrier Church. Réserve Naturelle du Bout du Lac and Jardins de I'Europe are also within 6 mi (10 km). 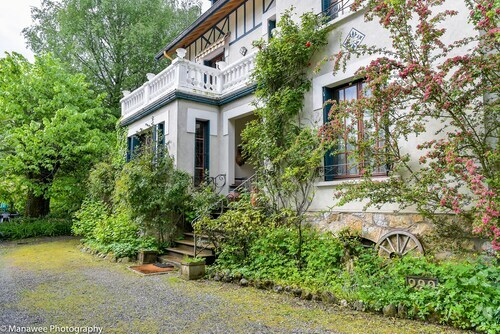 Situated on the waterfront, this property is 1.9 mi (3.1 km) from Lake Annecy and within 9 mi (15 km) of Sevrier Church and Jardins de I'Europe. Amours Bridge and Réserve Naturelle du Bout du Lac are also within 9 mi (15 km). How Much is a Hotel Room in Saint-Jorioz? Hotels in Saint-Jorioz start at $96 per night. Prices and availability subject to change. Additional terms may apply. Thanks to Travelocity, you are spoilt for choice when it's time to start checking out the perfect places to base yourself in Saint-Jorioz. Thanks to Travelocity's comprehensive travel guide, you'll love finding 60 apartments and hotels within a 6-mile (10-kilometer) radius of Saint-Jorioz's heart. For all the times you would prefer to book accommodation within a short walk of the main attractions of downtown Saint-Jorioz, you'll be perfectly situated at the convenient Hotel Résidence Spa Les Chataigniers. 16 miles (26 kilometers) away from the city center of Saint-Jorioz, you will come across the Chateau des Avenieres. Alternatively, the L'Impérial Palace is approximately 6 miles (9 kilometers) away. The L Abbaye De Talloires and the Le Chateau De Candie are two more Travelocity-listed places to book accommodation around Saint-Jorioz. After spending time in Saint-Jorioz, you should make time to investigate the other cultural and scenic attractions of the Rhone-Alpes area. Rhone-Alpes is famous for its rural landscapes, rivers and lakes. The most popular holiday sites are ruins and traditional villages. Visitors and locals alike in this corner of France commonly enjoy snowboarding and skiing. 5 miles (8 kilometers) to the north of Saint-Jorioz, you will find Annecy, which is where you can spend a few hours exploring Annecy Castle and Menthon Castle. When you spend a few nights in Annecy, check out the Hotel Le Pre Carre and Les Tresoms. 4 miles (7 kilometers) to the east of Saint-Jorioz, you'll find Talloires, which is home to the Palace de Menthon and Le Cottage Bise. The Les Passagers du Vent and Lake Annecy Golf Course are popular places to discover when you're in Talloires. Simply because you're visiting somewhere new, who's to say you can't fuel your obsession with stadium sports. Find Stade Pierre Rajon 45 miles (72 kilometers) to the west of Saint-Jorioz. Find a Travelocity-listed room right by the sporting action at the Domaine des Séquoias or the Kyriad Lyon Bourgoin Jallieu. Located 8 miles (13 kilometers) from central Saint-Jorioz is Annecy - Haute-Savoie Airport. Find accommodation nearby at Hôtel du Palais de l'Isle or Best Western Hotel Carlton. 5.0 Fine hotel very near the airport. The hotel shuttle to and from the hotel Is a great help. The hotel is modern and very comfortable and convenient. 2 years ago by A verified traveler from La Jolla, Ca.